Today I’ll take a break from my BeTrue3D Printer project and look at some long overdue projects. Todays project is going to be printing Nylon, which is something I’ve wanted to try for a long, long time. The first step obviously is to get my hands on some Nylon, but which one? There are so many types, and I’m not really all the knowledeable in the composition and usages of the different models… luckily for me, Taulman3d has made a super nice overview of Nylon types, for this exact situation. I strongly recommend you go and read the full page on Taulman3d to learn more about it. I’ve picked the Alloy 910 to print, and marked it in the below image, which originates from Taulman3D. When I bought it, a long time ago, there was a list over ease of printing as well, where the Alloy 910 featured as the most easy Nylon to print, which was a huge reason for the choice as well! Below is taken from the Taulman3D page I linked to above. 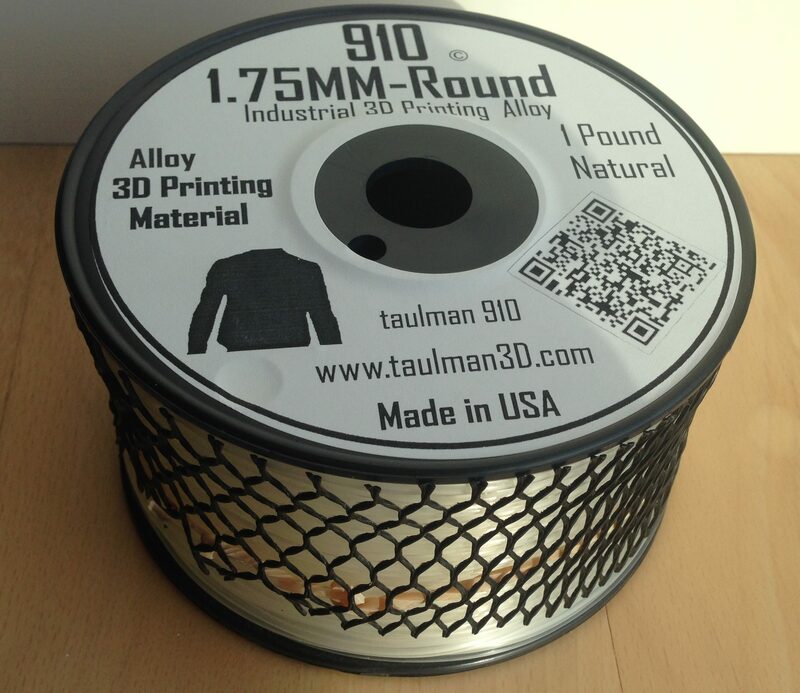 Alloy 910 = Alloy 910 is a significant development by taulman3D and both our chemical house and post processing company. The goal was to provide a super material with very high tensile, yet sufficient elongation to maintain a high degree of durability. Alloy 910, when 3D Printed comes in at 8,100 PSI Tensile and close to 12,000PSI when injection molded. * Any industrial parts that are currently being made of other high tensile polymers. * Chemical dip and tank supports. * Chemical resistant equipment covers. I primarily wanted to be able to print Nylon in order to create strong mounting parts and also to be able to print high quality gears, for which the Alloy 910 is a good choice. The Alloy 910 is also the choice of Nylon for high temperature applications. Alloy 910 has one very unique feature as well: There are no fumes when printing! I’ve only written the one directly relevant for printing and using Alloy 910. There are more informtion on the Specification sheet and much more detailed information in their Data Sheet (opens PDF). Ahh, now we come to the question that prevents many from trying to print Nylon. I opted to find a piece of glass, clean it using Acetone and clamp it onto my PEI-Coated Aluminium bed. Now I applied a thinish layer of Elmers Glue-All (any PVA glue should do I guess) and heated the bed to 65c untill it dried up. For my UM2+ clones I normally mix the glue 1:1 with water, but I applied it without mixing it here. How to get the temperature above 30c you might ask.. higher is preferable… luckily for me, or maybe just foresight, I have removable sides on my printer, attached using magnets, and I recently made a top for it as well, made from Acrylic plates I cut using a jigsaw and printed parts. I started out using the recommended values and printed slow. I normally print a good deal faster, but I’ve learned to start slow when starting to learn something new. Takes away the speed variable for failures in most cases. Ambient: 40c-50c (I call it my passively heated chamber, as the heat comes from the bed). First layer speed: 20mm/s – no need to go this slow. It stuck really well. I hadn’t configured the distance between nozzle and bed properly. I thought I could do it using babystepping, but for some reason it wouldn’t move Z to negative, so the distance was too great. Even though, it was only one corner that came loose, and not even much at that! Even though it wasn’t close to the glass it sat extremely like fused to the glass. I ended up putting the plate in the freezer, which made it pop free easily. Unless you use a Borosilicat plate you must be carefull not to drop a smoldring hot plate into the freezer, or the other way. I found a good article on Matterhacks on printing Nylon. To dry nylon filament, place it in an oven at 70c/160°F – 80c/180°F for 6 to 8 hours. After drying, store in an airtight container, preferably with desiccant (learn more about desiccant here).